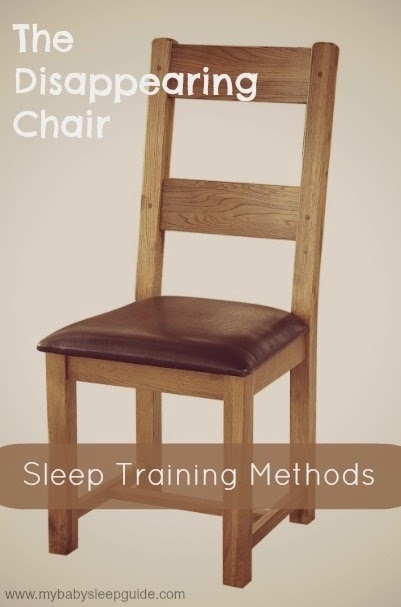 The Disappearing Chair - Sleep Training Method ~ My Baby Sleep Guide | Your sleep problems, solved! No, this post isn't about magic, although you may consider it magic if your child sleeps for more than 1-2 hours straight at night! If that's the case, then I suppose this post IS about magic. help out with that last issue however I can! What is the Disappearing Chair Method? First up is what I like to call the Disappearing Chair. It is a Fading Sleep Training Method, although one that will involve some crying. It is a method between controlled crying and no-cry where you slowly move yourself outside of your child's room during sleep training. The popular Sleep Lady's Shuffle is a version of this method. This method allows you to be there to support your baby during the sleep training process, but it still puts all the learning in your baby's hands. How Do You Use The Disappearing Chair Method? You'll find various names for and variations of how to do this method but I'll give you the gist of it with some of my recommendations. As for what to do, once you've done your normal routine before sleep (yes, this needs to be in place first--take a look at this post for some suggestion of what to do before starting sleep training), instead of using the usual prop to get baby asleep (nursing, rocking, patting etc), you will put baby in bed awake, but tired. This is the hardest part!! No sleep props allowed! Next you will sit in your chair next to baby's bed until she falls asleep. You will want to be unengaged (as in don't smile at her, and possibly don't even look at her--in the least don't consistently look at her). You will move your chair farther and farther from baby (see how below) until you make it all the way out of her room. Each time baby wakes up you will offer a word of comfort and quick touch (if you choose to do so) and then resume your previous chair position. 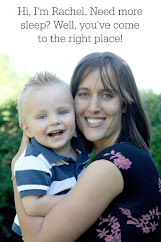 Once you get out of your child's room you have the next big step--being near your child but not in her sight. For this step, you will offer a word of comfort from outside her room instead of your presence and touch. How quickly you move the chair out of the room and how much comfort you offer while doing this (words said, touch, snuggling, holding) is up to you. You've got two extremes of chair movement and touch. First up is the really slow mover. They will stay with baby at each position until baby is comfortable. Then they will move to the next position. They will likely be offering lots of comfort in the form of words and touch while they do this. This can take weeks or months. The next extreme would be moving farther from baby every single day and offering no words or touch. I personally prefer moving about every 2-3 days. This way you aren't creating a new sleep prop (your position by baby) that you end up having to break with every single movement. Baby will probably still be upset with each movement, but you are giving her some time to adjust without dragging it out endlessly (which I think just makes it harder for all involved). As for the amount of touch and words, you will want to decrease this as the days go by and most importantly, make sure you do not do this constantly or use this to help baby fall asleep. You don't want this to turn into another sleep prop either. You are using your word and touch to offer baby a bit of comfort, not to help her fall asleep. She needs to learn this part on her own. Just like the pre-sleep routine helps get baby ready for sleep, you'll want some sort of consistent touch and words you say that help to trigger "sleep time" for your baby. Something like "it's time to sleep, I love you" or a couple pats might do. I personally wouldn't pick baby up at all, but like always, this is totally up to you--everyone has a unique baby and situation. Feel free to adjust the method above in anyway you feel will be helpful for your situation. Just keep the idea of sleep props in mind. Is what you are doing helping to elimination them or are you just exchanging one prop for another? Most likely a couple weeks, but it can take months if you do a really slow fading method. It will take a bit longer if you are doing this with an older child. What age do I start? This is always the big, debatable question (that is, if you get past the question of whether or not you should do sleep training at all). Generally, the earliest recommended time to start is between 3-6 months of age. How long can this method be used? This will depend a bit upon the child and require some alterations as the child gets older, but you should be fine using it through age 5. Why Or Why Not This Method? With this method you get to be there supporting your child through sleep training which hopefully will lead to the both of you feeling more confident and less upset during the sleep training process. There's a 99.9% chance your child will cry (I made up that number, but I think you get what I'm getting at--your child will in all likelihood cry!) but you will be there by them while they do it. You will not be actually helping your child go to sleep, but you will be there to comfort them a little as they learn to do it. Because this method involves crying, it will not be for some people that like really gentle methods. This method may be a little too time intensive for some people that have other children they need to tend to (i.e. they aren't able to sit in a chair in a child's room all day while they work on naps). Sitting next to your baby while they cry may also be more upsetting for a parent than doing another method like controlled crying. Some critics believe that letting baby see you as they fall asleep is actually more upsetting for baby because they keep expecting to get picked up or fed like they usually are. How do I deal with a standing, rolling and crawling? My general rule is to ignore it for the most part. If occasionally laying them back down doesn't cause issues, go ahead and do it--but it needs to be occasional. You can also encouragement them to lie down and go to sleep with your words and a pat to the mattress (once again, only occasionally do this) if they are old enough to understand this. How do I handle a child that gets out of bed? The first time they get out of bed, put them back into bed and let them know that they need to stay there. Say this with no emotion and very simply. Do not start some sort of monologue! It's tempting but don't do it! If they get out of bed again, put them back but don't say anything this time. Get right back into your chair. Some people like to snuggle the child as they put them back into bed, I personally don't think it is the best idea--it reinforces the getting out of bed. If getting out of bed is very rare, then feel free to do it (assuming you don't notice any bad effect from it-i.e. child gets out of bed more often when you snuggle). If a child is too young to understand how to stay in bed then they shouldn't be in a bed! If they are crawling out of a crib, you will just have to keep putting them back using as little emotion and words as possible. You'd be surprised how much a young child can understand, whether through words or actions. If your child keeps getting out of bed even when you put them back (and you truly aren't showing emotion or too much attention when you put them back), you may need to up the tactics. That is a whole other long post though. What If You're Not Noticing Improvement? If things aren't going so peachy, you'll want to double check a couple things. Most importantly, are you being consistent? If you aren't consistent, you will give your child lots of mixed messages and actually make things take much longer than they would otherwise. Have you given the method enough time to work? No, 3 rough days isn't enough time. You'll want to give it several days at least. Go grab a favorite carton (or three) of ice cream to help you carry on. Are you putting baby to sleep too drowsy? If a baby gets put to sleep too drowsy he may not know how to get himself to sleep from the non-drowsy state when he wakes mid nap or in the middle of the night. Are some sleep props used too close to bed causing issues? Sometimes something like rocking or nursing right before sleep but not to sleep can be an issue. Your baby may desire these things at nap times or when waking throughout the night. Does your child have any sort of health issues? You might want to consider a doctor's visit if you feel something may be amiss (although, if they sleep just perfect next to you or when you feed them then set them down, this is unlikely). My general advice with illness is to try to keep sleep as normal as possible, giving extra attention as needed. Sleep may get off track a bit (especially if you don't have firm, good sleep habits in place first) but make sure to get right back on track when the illness is over. During the illness, you may want to halt your chair moving or even move a bit closer for a bit. If your child is really unwell you may need to give even more attention than this (like holding and cuddling). What Do I Do When Sleep Gets Off (aka, sleep gets all crappy again)? Sleep Training isn't usually a one time thing. You shouldn't ever have to start the whole sleep training process over from scratch, but you may need to do it to a smaller extent here and there as your baby goes through different developmental phases, you go on trips etc. Some personalities will need sleep training to be repeated more often than others. If you are consistent in your sleep expectations for your child and they have sleeping down pretty solid you will most likely not have too many hiccups along the way. What Do I Do If My Child Wakes Up Out of the Blue? If your child usually sleeps well and suddenly wakes up, I would check on them to make sure they are ok. If all seems well, then go ahead and return to your current chair position. At this point, you should be located outside baby's room and just be using your voice to comfort. So those are my possible culprits, but I'm not sure how to narrow it down or what, if anything I should do about it. In your experience, have any of the above been factors in wakings during the first few hours of night sleep? Do you think I should do anything about this? The first bit of the night is usually the deepest sleep (more sleep issues pop up later throughout the night) but it's possible, since this started with the crawling, that he's still in 'crawl mode' when he goes to sleep and it is disrupting his sleep a bit. The nap change may be adding to things also. Either way, it doesn't sound like too bad of a deal and my guess is that things will clear up if given a little extra time to adjust to things. What you describe sounds normal and is nothing to worry about. Babies (and adults!) wake up between each change in the sleep cycle (roughly every 45 min for babies). As adults, we roll over, fluff our pillow, and go back to sleep without remembering in the morning. Babies wake up between cycles and sometimes cry or whimper a little but then go right back to sleep because the training you did taught them to fall asleep on their own. Enjoy your self directed child! My son is 3.5 months old. I recently went back to work as a nightshift nurse 3 nights a week. My friend watches my son in the early part of the day until about 2p. My husband watches him overnight and on weekends. Previously, my son was doing OK with naps (40min-1hr) and went to bed really well, but always needed a pacifier. Now, he is having a really hard time going to bed, esp with my husband. It can take up to 2 hrs for him to finally stop crying and fall asleep. We have since started a pre-sleep routine that includes turning on a lullaby elephant while we change his diaper and clothes in his room, then walking to our room across the house to swaddle him, hold him while he gets drowsy with his pacifier and new lovie (a sound machine giraffe that I have sprayed breast milk on). Our ultimate goal is to calm him down enough to put him in his bed awake. My husband has been doing the Shush Pat, but if he does that for the recommended 7 min-our son falls asleep and won't he then come to expect that to always fall asleep-undoing everything we have been trying?? We have discussed CIO, but I am not sure I have it in me to stick with that. We feel like we just need some direction on how to do this so we can stay consistent and get our baby the sleep he should have. The shush-pat can turn into a prop. I would try to do it until baby is drowsy, not asleep, and reduce how much you do it over time (fade it out). Ideally over time you'll work to putting him down calm, but not drowsy. Great job for implementing a sleep routine! Can I get a reply to my comment/question please? ?? First off, let me just say that my child is a very needy baby. I have tried a few other methods that havent worked so i want to try this one. I have a lot of questions about this method tho: Do I move the chair in the same night after they've fallen asleep? You talk about how this could take weeks or months but How long do I do this each night? When am I "allowed" to leave and go get some housework done?? If he wakes after I've gone downstairs what do I do? Also what if at any point my baby starts crying really loud/freaking out? Do I pick him up? Do I start the whole process over? Hi! Thank you for posting this information :) I am considering doing this with my 3 and 5 year old boys who I currently co-sleep with. I asked a "sleep professional" I happened to sit next to on a plane and she said she recommended I shortened this method to 3 days with my boys since they're older and they understand. What are your thoughts on this? Do you think there may be a better method for older kids in my situation (moving to they're shared room after co-sleeping with me their whole lives)? Thanks again!